It’s the end of 2017 and where is Employee Central Time Management? When starting the development of our Employee Central Time Management functionality we wanted it to be engaging, localized, and functionally complete. We understand that in the time and attendance domain many regulations are in fact set in stone (or the CLA equivalent) and it is our aim to cover these 100% because we know that 99% often is not good enough. Therefore, the robustness and the flexibility in our offering needs to be top class. As a follow up to last year’s post I’d like to describe what we have accomplished this year and where the Employee Central Time Management journey is heading in the near future. Where is Employee Central Time Management today? In 2017 we made great progress from a solution adoption perspective. Our customer base more than doubled compared to 2016. We now have ~500 customers using our solution in more than 150 countries. 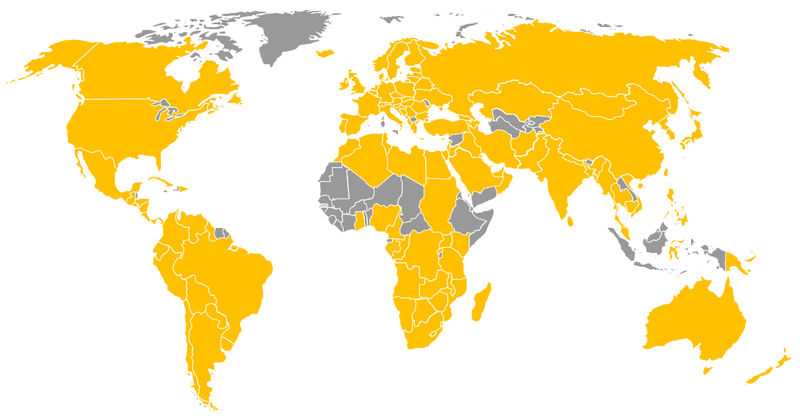 These countries are highlighted in yellow below. As you can see it is a very global spread. When looking into the details we see that our Time Off functionality is most heavily adopted. Therefore, we are convinced that all the focus we have put on our localization is paying off. In addition, since 2017 we also see mass adoption for our time sheet. 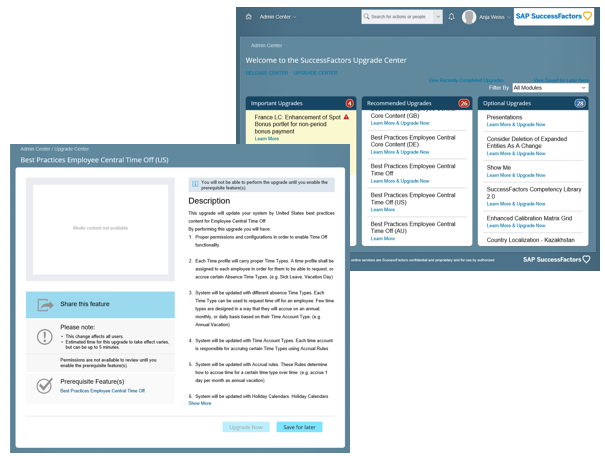 We see that 100+ organizations are now using Employee Central Time Sheet. For now, mainly for the use cases around overtime and on-call/allowance recording. Read more on that in this post. We expect that this provides great benefits to customers who want to be up and running quick, and supported by a solution which support local law and regulations. What are the 2017 highlights? 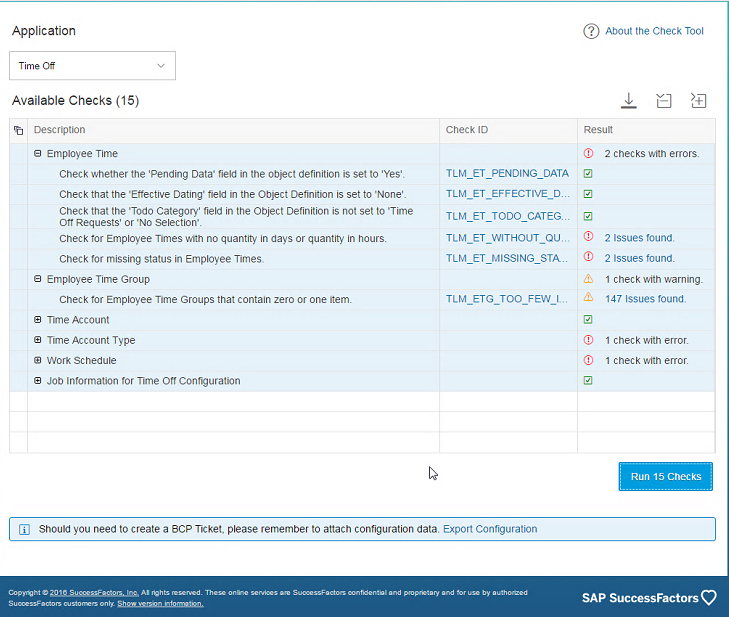 In Q1 of 2017 we brought the Employee Central Time Sheet to our SAP SuccessFactors mobile app, to accompany the already available mobile Time Off functionality. 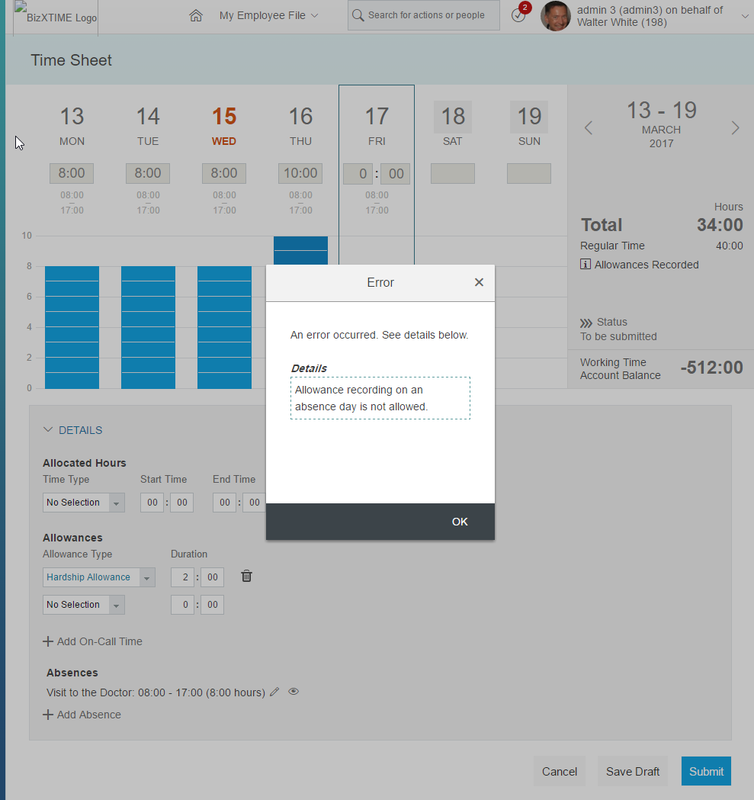 Next to filling out time sheets, employees can make amendments to previous time sheets, get previews and week summaries for quick insight and decision making. 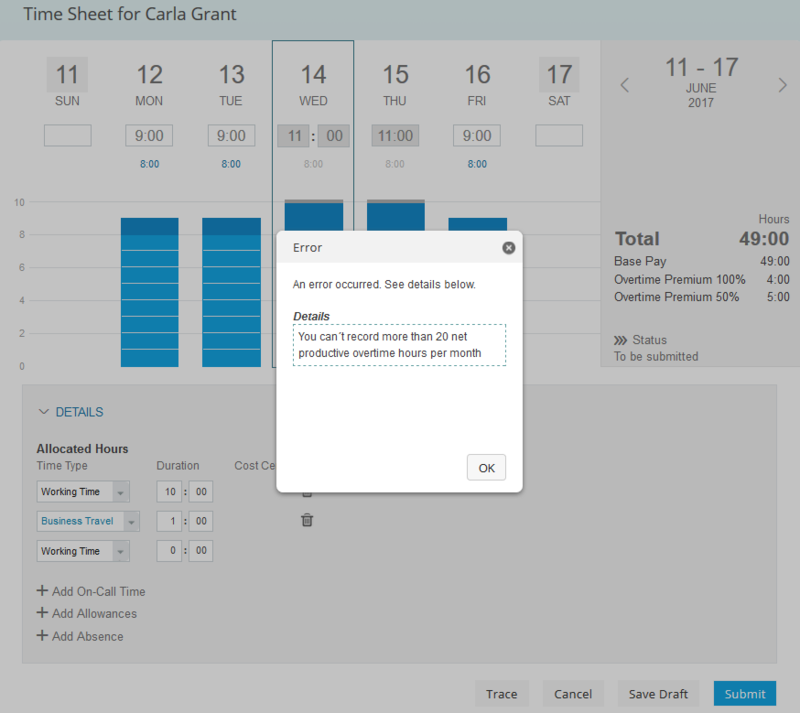 And of course, managers can easily approve time sheets in their SuccessFactors App. 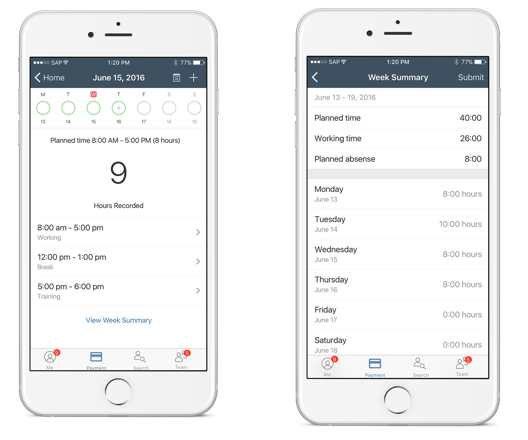 This mobile functionality is very straight forward to deploy because the already configured time recording profiles will automatically be respected and utilized. To make our functionality more robust we started in our Q1 release by delivering a new validations framework. This framework can be used to configure collision checks. Particularly useful in cases when you want to avoid employees from recording working time when e.g. an absence exists, or recording allowances on a day off. 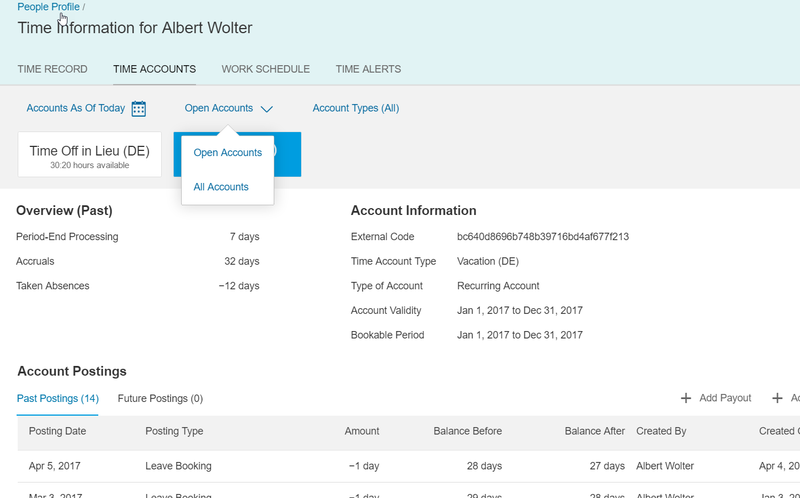 The collision checks can also be leveraged to automatically split and delimit absences records, when for example employees get ill when on holiday. Obviously, we support many more use cases in which the validations will help the employee to make the right choice. Monthly collectors could e.g. help to reward extra in case of more than 5 late shifts are entered that month. 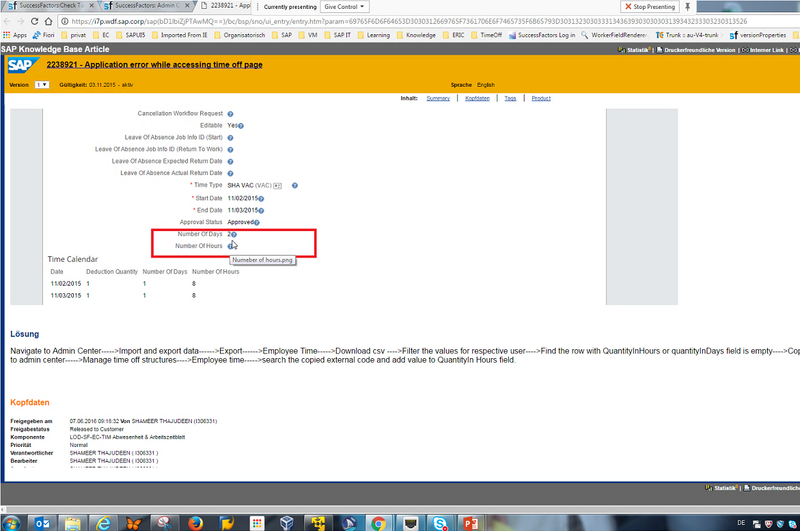 In the below screenshot you see an example of a time collector which raises an error when more than 20 overtime hours per month are recorded. This means that it aggregates the values of the time sheets for that month and returns an error in this case. The Time Collector functionality massively improves the complexity we can handle in our real-time time-evaluation. Of course the Q3 release was only the start for the Time Collector functionality. 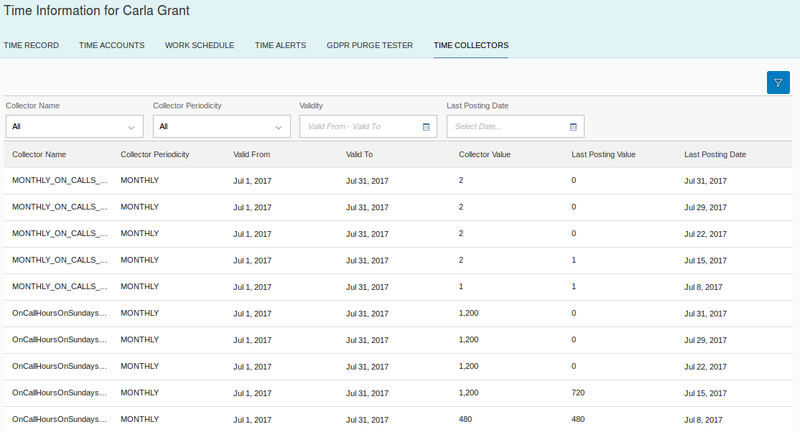 In Q4 new functionality was added to make the framework more robust and to provide time administrators insight in those collectors when they need it. This will help the time administrators to understand the current value of employee’s time collectors, so that they can inform employees in case of questions. On an aggregated level these values can also be used via reporting if the time administrators want to inform senior management on the current state of the business. We understand that Employee Central Time Management in many cases is a linking pin. Therefore we have released an ODATA API for planned times and absence hours. The API “Employee Calendar” provides planned working time per day (incl. temporary work schedule information), public holiday class, absence hours per day and “availability” hours (which is the delta of planned and absence hours per day). This information is very useful when you need to replicate things like planned times, absence types, and hours per day to a payroll system. The API can be accessed directly from our Integration Center. And of course, as the only vendor who delivers true global HR Core including payroll, our end-to-end processing capability is hugely important. In previous years we already ensured that our Employee Central time-evaluation results correctly flow into our Employee Central Payroll. In 2017 we worked on country specific cases. Our end-to-end solution now offers a Termination Workbench which supports the highly complex Australian leave liability calculations, based on Employee Central Time Off as the leading time management system and with Employee Central Payroll as payroll system. It supports the end-to-end employee-termination process that starts in Employee Central and ends in EC Payroll. The foundation for the functionality is a combination of payroll results and leave entitlements. The complexity in Australia is that employees can have monthly accrual in the current year, but are entitled to take it only in the following year. However, in case of termination the employee is eligible for the time account payout of the total accrued value (current + next year). This all works nicely now in the application, including even simulation functionality to understand liabilities for the future payout amount. As discussed at the beginning of this post Employee Central Time Management is designed to be very agile for the employee. Therefore, we keep continuously updating and improving the functionality. In 2017 have delivered a.o. updates to workflow and balance visualization. 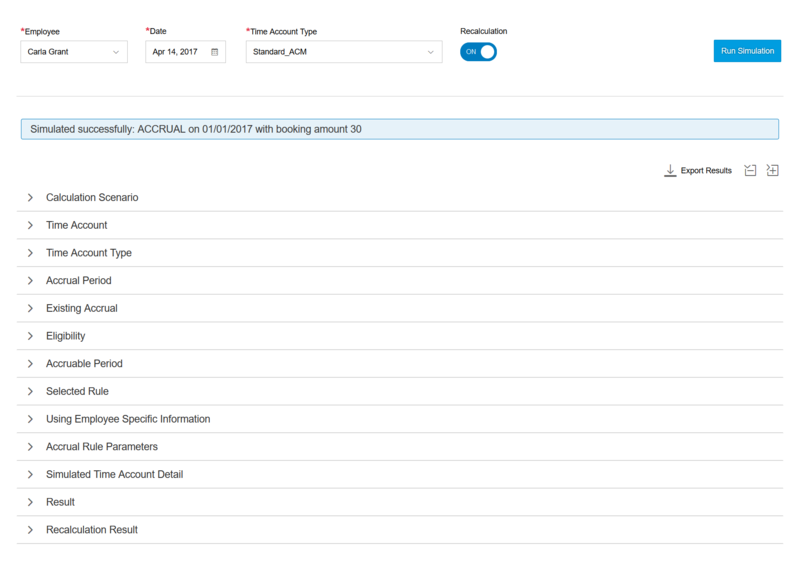 Employees now have a full overview of all approved, pending and declined absence workflows in their Time Off application. Secondly employees will only see the balances for absence types when it makes sense for them. This avoids them seeing e.g. an illness balance because this is not something an employee should be bothered with. And of course this balance is relevant (and visible) to HR. This functionality greatly helps the administrators to process their periodic tasks quicker and with greater certainty. When configuring the Time Management application there obviously is a need for tools which provide insight, and to quickly run tests and validations. Working with real-life test examples is critical to quickly work through the scenarios you need to configure. 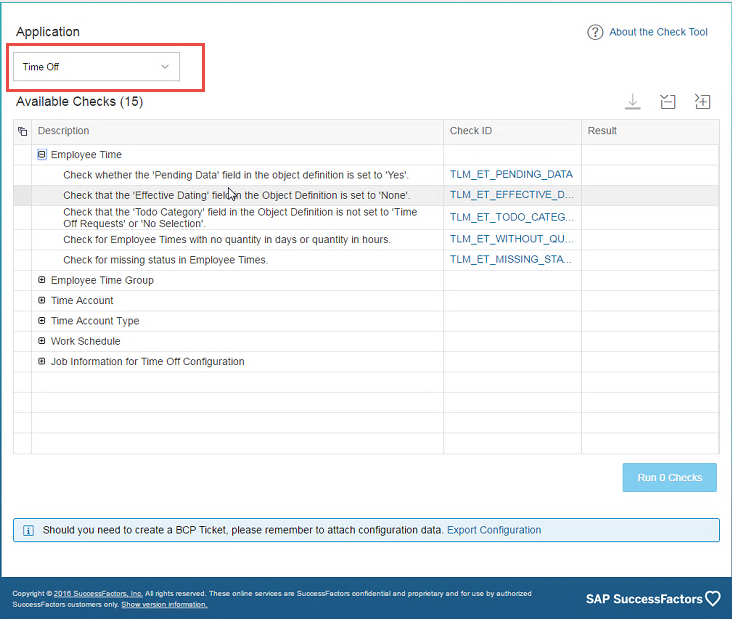 To provide this agility during configuration we have released the new Time Configuration Search functionality. The second support instrument I want to highlight is the Check Tool. The name says it all. We found that in many cases customer tickets were based on configuration inconsistencies. Very often the reason was false data entry. Therefore, the idea was born to develop a ‘check tool’, which would help customers during implementations, and at the same time would help our support engineers when resolving issues. All the most common checks and validations you might encounter are included. As you understand by now we are not only working on making the application more user friendly, but also (equally important), making it easy to implement. This means that our customers can benefit from all the operational benefits cloud software brings. And if you need detailed information on any of the topic addressed so far I can highly recommend the quarterly release descriptions that my colleague Volker Ruof posts. With the functionality available today we are convinced that we deliver a solution which is very easy to use (many references claim that after rolling it out they need 0 training for employees and managers), and it offers a very powerful calculation and valuation engine for the overtime and pay-rules. It handles complex calculations and it is flexible to meet the needs of global operating organizations. However, we are not there yet. Based on customer feedback, and our own 40+ years of experience in developing time management functionality, we know that we need a few essential elements. Therefore, in 2018 we plan to ‘open up’ our Time Management application so that information from 3rd party applications (e.g. clock terminals, web clocks, biometric devises, etc) can be loaded into our time sheet to run the time evaluation based on that (raw) data. And of course after processing that data there is always the need for corrections when e.g. employees forgot to punch in or out. Therefore, we plan to deliver functionality to support these use cases as well. In parallel we are exploring how we can improve our labor distribution based on time allocation to WBS elements, orders, etc and the ability to immediately utilize this in related ‘ERP processes’. We are evaluating how we can deliver great functionality jointly with our S/4 Cloud application. This would combine the robust time evaluation capabilities in Employee Central Time management with the great capabilities S/4 brings for billing, accounting, logistics, or others. Therefore, keep close eye on our roadmap. And lastly, of course we know that our Employee Central Time Management will not cover all use cases. Particularly not when requirements are heavily impacted by very complex union regulations and/or ‘driven by operations or logistics’ with a high need for any type of planning, scheduling and forecasting. For those use cases, we have our best-in-class solution offering via SAP Time and Attendance by WorkForce Software. More information on when that might make sense you can find here. And in the meanwhile, if you have any questions, please always feel free to reach out!